The Hong Kong Heritage Museum is built in the traditional style, this building stands in close contrast to harmoniously blended houses built around a central courtyard. Located within a wooded setting just out of view of Sha Tin’s towering housing complexes, the Hong Kong Heritage Museum is worth to visit. Its construction is unique and can be easily recognized. 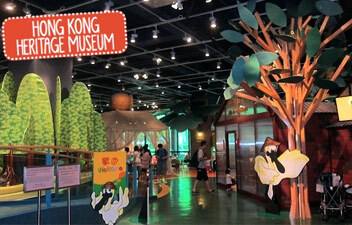 The museum opened to public in 2000 and has 12 different galleries or exhibition halls. Its purpose is to preserve Hong Kong’s art and cultural heritage. The six permanent galleries are the Cantonese Opera Heritage Hall, the Orientation Theatre, the T.T. Tsui Gallery of Chinese Art, the New Territories Heritage Hall, the Chao Shao-an Gallery and the Children’s Discovery Gallery. The other remaining six exhibition halls regularly change and feature themes of special interests, but are definitely worthwhile to have a look as well each a treasure trove of relics that express the history, culture and arts of early Hong Kong and the nearby South China region. The Hong Kong Heritage Museum has organized an exhibition in collaboration with the Bruce Lee Foundation in the United States. Its aim was to highlight Bruce Lee not only as a film star and martial artist, but also as a cultural phenomenon. There are about six hundred invaluable items of Bruce Lee memorabilia provided by locals, overseas people and several organizations. The visit to this exhibition hall is an opportunity to greater insight into his contributions and achievements and also to his significance in popular culture. On one part of the museum has a collection of beautiful Chinese paintings by the well-known artist Zhao Shao'ang, and a comprehensive and colourful exhibition tracing the development of Cantonese opera.